sociological research but from inspired Scripture. The subject is a group of spiritual children, Jewish Christians who are rebelling and pulling away from Christ. They are suffering persecution and wondering if the Christian life is worth the trouble. They know the right thing to do — maintain faith in Jesus. But that seems too hard, so they’re crossing their arms and turning away. After a brief introduction, the writer of Hebrews reminds his read­ers that they have “not yet resisted to the point of shedding your blood” in their struggle against sin (v. 4). He also reminds them that God calls them “sons” and encourages them as such (v. 5-6). After all, they’re Jewish believers who are very familiar with the Old Testa­ment, so they know the encouragement God has already given in Proverbs 3:11-12: “My son, do not despise the LORD’s discipline and do not resent his rebuke, because the LORD disciplines those he loves, as a father the son he delights in.” In other words, he acknowledges that they’re going through a hard time and suggests they consider whether that hard time is a matter of God’s discipline. If it is, it’s only because God delights in His children. Then the writer gets to his main teaching: “Endure hardship as discipline; God is treating you as sons. For what son is not disci­plined by his father? If you are not disciplined (and everyone under­goes discipline), then you are illegitimate children and not true sons. Moreover, we have all had human fathers who disciplined us and we respected them for it. How much more should we submit to the Father of our spirits and live!” (vv. 7-9). The passage gives a very human illustration: “Our fathers disci­plined us for a little while as they thought best; but God disciplines us for our good, that we may share in his holiness” (v. 10). The point? “No discipline seems pleasant at the time, but painful. Later on, however, it produces a harvest of righteousness and peace for those who have been trained by it” (v. 11). Do you see what Scripture is saying here? Far from being a dirty word, discipline is evidence of love. When you consistently disci­pline your child and do it with the right attitude — compassionately, under control, with consistent boundaries and consequences, and focused on the child’s best outcome — you are expressing love exactly as God sometimes expresses His love. It may seem uncom­fortable both to you and your child at the time, but in the long run, it’s the most selfless, compassionate thing you can do to set your child up for happiness in life and fruitfulness in God’s Kingdom. 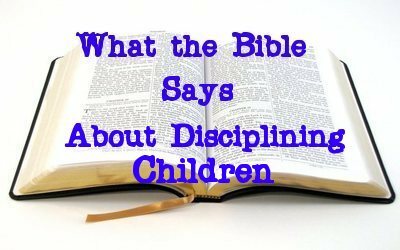 The Bible’s perspective on discipline is affirmed by what many psychologists and sociologists are now learning about child development: that children left to themselves will do what all people left to themselves in a fallen world will do. They’ll make bad decisions that produce pain and turmoil in their lives. Relationships won’t work right, money will be mismanaged and debt will pile up, conflict will erupt both within and without, and long-term goals will never be realized. So God tells the Hebrew Christians that the adversity they face comes from His loving hand, not because they’re bad, but because He wants the best for them. That’s our motivation as parents as well. This post reminds me very much of Tedd Tripp's book, "Shepherding a Child's Heart." Best recourse I've come across about rich communication (grace and love) balanced with the rod (Obedience and truth) A must read.